Natural lacquer, the sap of several tree species native to East and Southeast Asia, has been used since antiquity to protect and ennoble wood, bamboo, and other materials. As they evolved, Asian societies developed their own unique lacquer arts culture. Asian societies still produce lacquerware, but in our increasing fast-paced world, lacquer culture and industry is in decline. 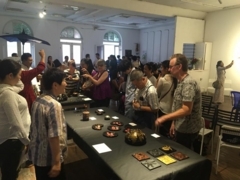 This event sought to increase awareness of the beauty of lacquer and the remarkable culture that surrounds this wonderful art and craft. 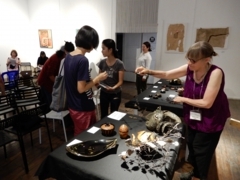 At all our events the goals are to: 1) Encourage Asian peoples to rediscover and preserve their traditional lacquer cultures; 2) Encourage artisans and artists to create new designs and renew lacquer’s relevance to our modern lifestyles. We believe that developing an understanding of Asian lacquer culture in its totality will lead to the strengthening of our individual lacquer cultures. 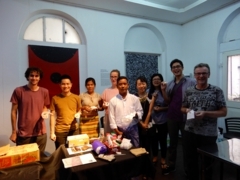 The Yangon Program was a collaboration between the Asian Lacquer Craft Exchange Research Project (ALCEP) and the Japan Foundation in Bangkok. 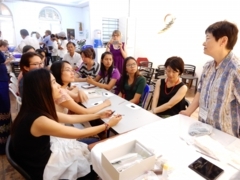 ALCEP began in Bagan in 2004 with yearly programs by Japanese and Myanmar lacquer experts. 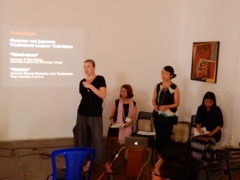 In 2014 the project expanded and since then has held programs in Laos, Thailand, Cambodia, and Vietnam. 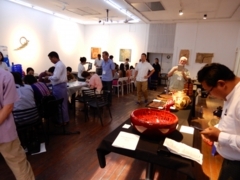 In Yangon, lacquer artists and artisans from Myanmar, Japan, Thailand, Vietnam, and Cambodia exhibited their art and discussed the state of the lacquer arts in their nations. 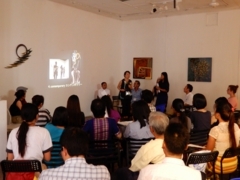 In the second discussion, discussants were asked what made them choose lacquer arts; what was lacquer’s allure? Answers were personal and varied, from being born into a lacquerware family, to the attraction of its history and traditions, to a love of working with the possibilities of the material itself. The floor was thrown open for questions and the audience actively joined in the discussion. 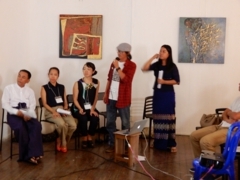 One audience member asked about the drawbacks of working with natural lacquer. 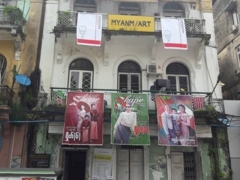 U Aung Kyaw Htun addressed some technical difficulties, the time needed to remove water and the time it took to harden in particular. He noted the lack of modern methods to speed up these processes. Trinh Tuan, however, noted again that while lacquer is not easy to work with, the final product had a luster and sheen not found in other mediums. He also noted that lacquer is a natural material unlike acrylics and varnishes. Myanmar lacquer techniques including gold leaf (shwei-zawa), and chinkin were practiced. Shwei zawa is a gold leaf layer technique. Yellow powder mixed with neem resin is drawn on the parts that are not to be gilded. Then, a thin lacquer coating is applied. Next, gold leaf is affixed to the piece. When dry the piece is washed removing the powder and resin revealing the pattern. Usng a simple shwei zawa technique, designs were created on 30 x 55 mm oval pendants. “Chinkin” is a gold-inlaid lacquer decoration technique using gold powder or leaf in etched grooves. The technique originated in China and later introduced into Japan. After the pattern has been incised into the lacquer surface with a fine chisel “chinkin-tou”, raw lacquer is rubbed into the grooves as an adhesive for gold powder or gold leaf pressed into them. In this workshop using chinkin technique, designs were created on 30 x 55 mm oval pendants.